The winners of the 49th annual Friends of the Riverhead Free Library Photo Show were announced at the event’s opening Friday night in the Elizabeth Fox Overton Gallery. The contest is run by chairwoman Thelma Booker, committee members Laurel Sisson, Arleen Peck, Claire Boehle, Eleanor Koller, Alison McCabe and Ron Ondrovic, and library director Joy Rankin. There were 90 entries this year in the show’s seven categories: animals, landscape, nature, people, abstractions/manipulations, flowers/gardens and structures/still life. 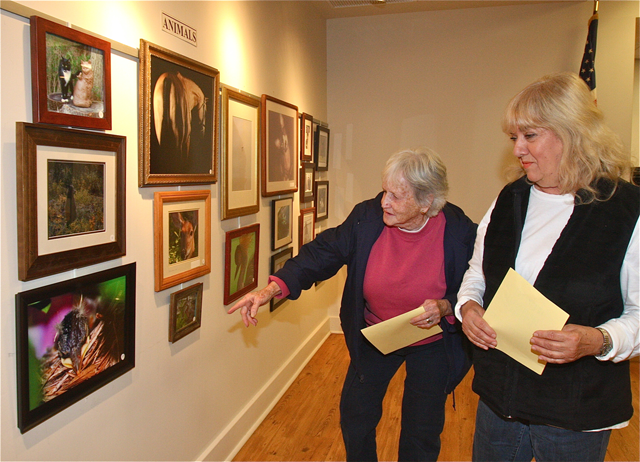 The judges for this year’s show were Adelaide Amend and Susan Ormano. The Best of Show award went to Meghann Belser of Mattituck for a portrait of a horse in the animal category and The Friends Choice award went to Jon Schusteritsch of Cutchogue for a landscape scene of docks and the bay at sunrise in New Suffolk. The show will hang through Friday Nov. 7 during regular library hours.